This space wallpaper is a compilation of three images from Envisat’s radar and shows where southwestern Africa’s Okavango River empties into the inland Okavango Delta in northern Botswana. This space wallpaper is a compilation of three images from Envisat’s radar and shows where southwestern Africa’s Okavango River empties into the inland Okavango Delta in northern Botswana. The Okavango River originates in Angola, forms part of the Angola Namibia border and then ends in northern Botswana. Here, it has formed a depression in the semi-arid Kalahari basin. Appearing purple at the center of the image is Chief’s Island. In the lower-right portion of the image we can see a large cluster of radar reflections from the town of Maun. 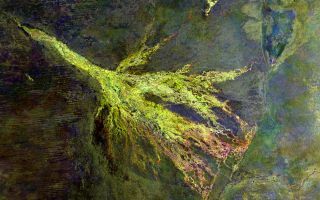 At the top of the image, a triangle with similar coloring to the delta can be seen. This is a swamp area and national park located mostly in Namibia. This image was released June 7, 2013.